Thanks to all the wonderful folks who came to my book signing last night at Omega Book Center. Your support means so much to me. Bookseller and store owner Karen Duncan always makes the signings so much fun. Last night, she had yummy brownies and delicious cheese rounds that everyone enjoyed. Plus, her refreshing herbal tea. I'm donating the proceeds of the signing to the local ST Vincent de Paul Food Pantry, which helps the needy in the area. 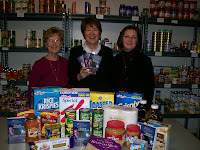 The photo shows me with the organization's president Sue Ford (right) and pantry coordinator Bonnie Fisher (left). Both gals, along with all the members, work hard to help folks facing difficult situations. The names of everyone who bought a book went into a drawing. Last night's gift was a "Think Spring" cooler filled with lots of fun items with a spring theme. Bonnie Fisher won the drawing. "I'm so excited," she said when I called her with the news. "I never win." KILLER HEADLINE is in bookstores and groceries across the country. Hope you'll consider adding it to your reading list. My church is having 136 hours of continual prayer. The week-long event started this evening. People will be in the church, praying for the needs of all, round the clock until the closing on Saturday. Everyone writes their prayer requests on slips of paper and places them in a box at the altar. Those prayer requests are lifted up to the Lord throughout the week. This evening, one of my prayer requests was for all of you who visit this blog and for your intentions. If you have specific needs you'd like me to place at the altar, leave them as a comment. May the Lord bless you and keep you always in His protective care. "Be faithful to the gospel and repent of your sins," the minister said in today's Ash Wednesday service when he took ashes (from the burned palms used on Palm Sunday) and made a cross on my forehead. Thus starts the forty-plus days leading up to Easter. Each year, Christians are given this time to focus on Christ and His message of love. Through prayer, fasting and alms giving, the faithful renew their commitment to the Lord and align themselves more closely to the gospel. I'll be praying for each of you throughout Lent. Please remember Lily Grace, a three year old with severe medical problems. Lily underwent surgery on the 16th and needs prayer. I know the Prayer Team is lifting up the people of Haiti. Please continue to ask the Lord to provide for their needs. The message, "Don't Limit God," keeps circulating through my mind. Every time I think I can't do something, in reality, I'm limiting God's ability to work through me. Are there ways you're limiting God? 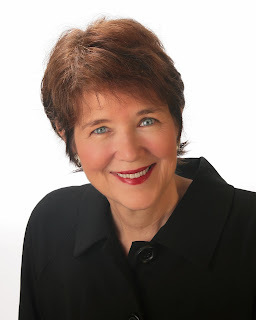 Prayer needs: Diane is having surgery for cancer. Jen--a young mom with 4 little children--is in the hospital with pneumonia. Pray for her hubby, too, who's taking care of the babies. I'm praying for all of you! Thanks for your prayers! "I must decrease and He must increase." mind recently. I must turn more and more of my life over to the Lord. Not an easy task. I'm praying for each of you. Hope you can feel the prayers. PS: Be sure to leave your prayer intentions so the Cross My Heart Prayer Team can pray for your special needs. Welcome to my blog! We'll be talking about books, writing and the power of prayer so be sure to mention your prayer requests. Members of the Cross My Heart Prayer Team (to sign up go to my Web site: http://www.debbygiusti.com/) pray for all the members each day, asking the Lord that the work of our hands will bear good fruit. They'll also be praying for your special needs. A dear lady named Jean needs prayer. She's in a nursing home and on hospice care. Her beautiful family ministers to her needs, but she could use your prayers. What I'm reading? I just finished THE HELP, by Kathryn Stockett. A fantastic book that made me laugh, cry, worry, and question. It's a keeper for sure! 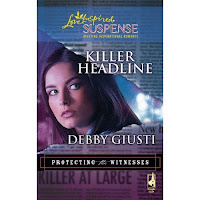 If you've enjoyed by books, look for KILLER HEADLINE, on sale in bookstores now. It's book #2 of the Protecting the Witnesses Continuity Series from Steeple Hill Love Inspired Suspense. If you didn't get the first book, don't worry. You don't have to read the other stories to enjoy KILLER HEADLINE. I'll post more about the book in the days ahead. I pray for all my readers each day. That includes blog readers too! Hope you can feel the prayers.